Greetings from The 88 Project! We are bringing you news, analysis, and actions regarding human rights and civil society in Vietnam during the week of July 30-August 5. Pro-democracy activist Nguyen Trung Truc will face trial on August 17, over a year after he was initially arrested; it is unclear whether or not he will be able to meet with his lawyer before then. On August 2, we remembered female political prisoner Nguyen Dang Minh Man, a photographer and activist serving eight years in prison. This week, US officials privately confirmed the arrest of US citizen Michael Phuong Minh Nguyen in Vietnam; charges are unknown, and Mr. Nguyen now faces several months of incommunicado detention under Vietnamese law. One of Vietnam’s most well-known political prisoners, Tran Huynh Duy Thuc, has once again refused to be exiled from Vietnam in exchange for early release; instead, he continues striving for peaceful change in Vietnam by using new Vietnamese law to attempt to obtain an exemption for the remaining seven years of his 16-year sentence. Young activist Tran Hoang Phuc continues to suffer from health issues and difficult conditions in prison, elaborated on in a recent letter from his mother to the UN. This week, fifteen more people were sentenced to prison in the aftermath of national protests in June, and a farmer who had also participated in the protests was found dead in police custody under suspicious circumstances. In the news, read about Will Nguyen’s return to the US after being detained in Vietnam for over a month, as well as reactions to yet another detention of a US citizen, Michael Nguyen. You can take action for him by signing the family’s petition on Change.org. This week, we remember pro-democracy activist Nguyen Trung Truc, who was arrested under Article 79 of the 1999 Criminal Code on August 4, 2017, just days after a mass arrest of other members of the Brotherhood for Democracy. He is currently in pre-trial detention; the trial has been set for August 17 in Quang Binh province. As of April 2018, he had still not been allowed to meet with his lawyer, and it is unclear if he will be able to do so before trial. This week also marked the arrest anniversary of female political prisoner Nguyen Dang Minh Man. She was arrested on August 2, 2011 as part of a crackdown on Catholic youth activists and later sentenced to eight years in prison. She had previously photographed protests and reported on police brutality. In prison, she’s faced solitary confinement and has been on hunger strike several times. She is due to be released in August 2019. The US Embassy confirmed this week that US citizen Michael Phuong Minh Nguyen (above, with wife and children) has been detained in Vietnam after travelling there for a vacation and to visit family. He was detained on July 7, and the circumstances around the detention remain unclear. He is being held in Ho Chi Minh City without charges but allegedly under investigation for “activity against the peoples’ government.” Michael will now face several months of an initial investigation period, which is eligible for extension, which will prohibit him for receiving communications and visits; though, he is supposed to be allowed one visit from US consular representatives per month. Read the family’s press release on the situation, here. Imprisoned blogger and entrepreneur Tran Huynh Duy Thuc has written a series of letters home to his family about prison life and his thoughts on the activist movement today in Vietnam. In the first of a series of translations, this letter details his most recent visit from foreign officials on June 25, in which he reiterated his wishes to remain in Vietnam and continue working for peaceful change, even if it means he must serve the rest of his 16-year sentence. However, in a petition to the Vietnamese government, Thuc has used Vietnamese law itself to advocate for his release, citing new legal provisions that should exempt him from having to serve the remainder of his sentence. He was charged with “attempting to overthrow the People’s administration,” under the 1999 Code, and “attempts” no longer carry criminal liability under provisions in the 2015 Code. Additional new provisions also allow lesser punishment/liability from the 2015 Code to be applied to existing sentences. Thus, Thuc is hopeful that he will not have to serve his remaining seven years in prison and five years of probation. Vietnam has jailed fifteen more people in connection with nationwide protests that occurred in June 2018 over proposed legislation on special economic zones and cybersecurity. 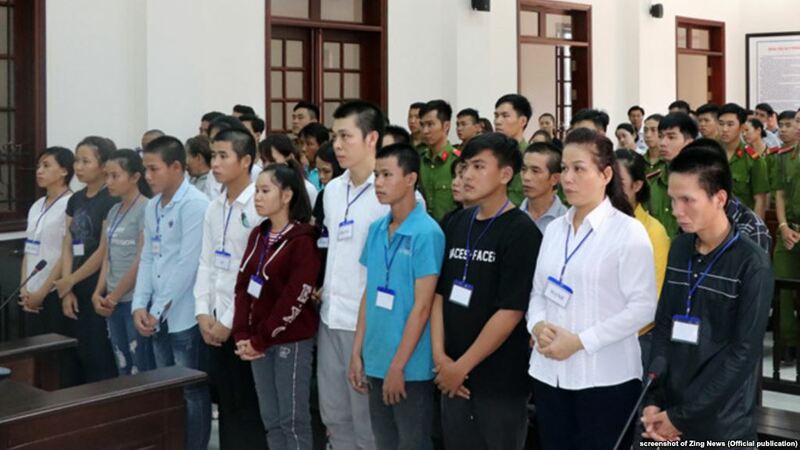 The fifteen were sentenced by a court in Bien Hoa city to periods ranging from eight to up to 18 months in prison for participating in the protests. Others were given probationary periods. Sixteen others were jailed last week in Binh Thuan province on similar charges. Hua Hoang Anh, a farmer from Kien Giang province, was found dead in custody this week. He had been brought in for questioning regarding his participation in the nationwide June 10 protests; he was recognized after protesting in Ho Chi Minh City. Police announced his death as a suicide, but many question this, as Anh had sustained injuries on his neck and head. This was not the first time Anh had been targeted by authorities for his activism. This case echoes that of Hoa Hao Buddhist Nguyen Huu Tan, who was declared to have committed suicide in custody after being detained, despite inconsistencies with recorded footage and Tan’s injuries. You can take action for Michael Phuong Minh Nguyen, calling on Vietnamese authorities to release him from detention, by signing this petition on Change.org. “For any government to incarcerate anyone without any probable cause is a blatant violation of human rights and of international law, especially if the detained is a citizen of another country,” says the petition, which hopes to raise enough signatures to be sent to US Secretary of State Mike Pompeo.